Beautiful modern Ellipse rocking chair designed by Renato Zevi and imported by Selig. This chair is the epitome of classic mid century modern design with it's stunning lines, bright chrome, and eye catching-form. 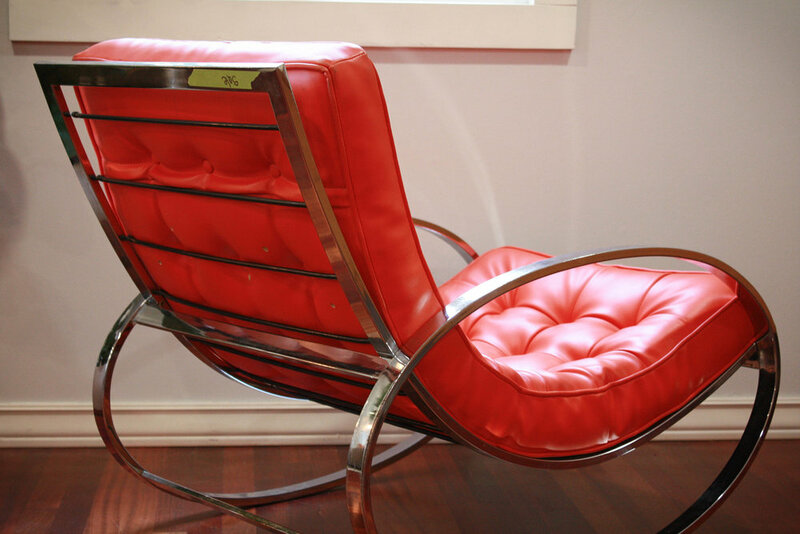 This lounge chair is in good vintage condition with minor markings on the chrome frame, commensurate with age and use. The blood orange naugahyde is in very good condition and can be used for many more years. If you had a different fabric or color in mind, reupholstery would be very cheap since its a single tufted cushion. The rear back springs and canvas seating area are excellent and show no signs of breaking down or compromise. This chair is the perfect lounger to sit back, relax, and read a book.